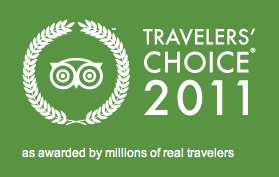 TripAdvisor just released the 2011 list of Travelers' Choice Awards for the World's Best Hotels. Nine of the top 25 world's best are in Europe. That's pretty good! All nine of them sound wonderful, and we haven't overnighted in a single one of them. Looks like I've got some work to do!